Tucumán ([tukuˈman]) is the most densely populated, and the smallest by land area, of the provinces of Argentina. Located in the northwest of the country, the province has the capital of San Miguel de Tucumán, often shortened to Tucumán. 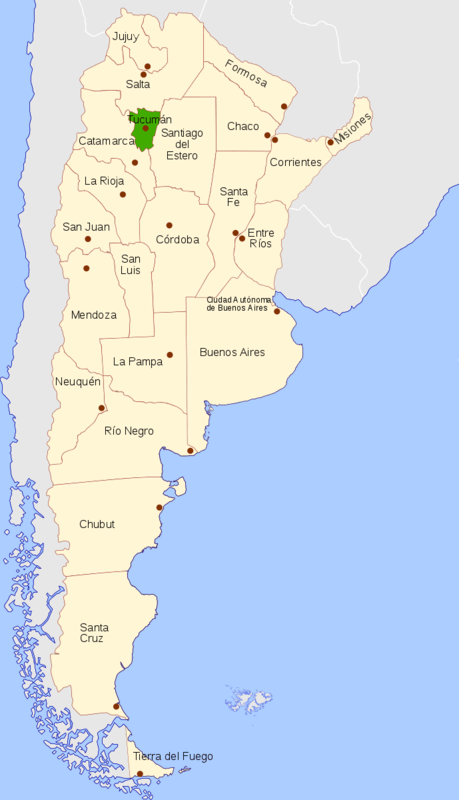 Neighboring provinces are, clockwise from the north: Salta, Santiago del Estero and Catamarca. It is nicknamed El Jardín de la República (The Garden of the Republic), as it is a highly productive agricultural area. Before the Spanish colonization, this land was inhabited by the Diaguitas, who practiced agriculture. The Salí is the province’s main river. Tucumán also has four dams that are used for hydroelectricity and irrigation: El Cadillal on Salí River, the province’s most important dam; Embalse Río Hondo on the Hondo River; La Angostura on de los Sosa River; and Escaba on the Marapa River. The Santa María River crosses the Valles Calchaquíes. Tucuman lies at the convergence of temperate climates and tropical climates further north, retaining characteristics of both in the lowlands. Furthermore, it is highly monsoonal, and depends also on elevation. As a rule of thumb, the far east is dryer and hotter, whereas the Piedmont has many storms in the summer which moderate temperatures. The first foothills are very humid, provoking a dense jungle, and as altitude increases, a thick forest and then cool grasslands. The westernmost areas are once again a bit dryer because of a rain shadow. The abundant precipitation creates a wide area of abundant vegetation and justifies Tucumán’s title of "Jardín de la República" (Garden of the Republic). Known internationally for its prodigious sugarcane (with 2,300 km², and the sugar production, 60% of the country's), Tucumán's economy is quite diversified, and agriculture accounts for about 7% of output. After the sugar crisis of the 1960s, Tucumán tried to diversify its crops, and now cultivates, among others, lemons (world first producer), strawberries, kiwifruit, beans, maize, alfalfa, and soybeans. Manufacturing in Tucumán initially centered on sugar production, but has diversified significantly since 1960. Sugar mills add about 15% to the total economy. Besides the industrialisation of the sugarcane into sugar, paper, and alcohol, food, textile, automotive, and metallurgical industries are present. Among the latter, the freight-truck assembly operated by the Volkswagen Group-controlled Swedish Scania company is probably the best known. Mining is a minor activity, centered on salt, clay, lime, and other non-metallic extractions. Cultural and sport tourism is common in the province, and attracts a number of Argentine tourists every year. The Panamerican Highway (Route 9) crosses San Miguel de Tucumán, and connects it with Santiago del Estero and Buenos Aires. The city also serves as a mid-stop for tourists visiting other provinces of the Argentine Northwest. The Teniente General Benjamín Matienzo International Airport has regular flights to Buenos Aires and Santa Cruz de la Sierra, and receives almost 300,000 passengers every year.